UN employee among the latest to test positive for deadly virus in current outbreak, which has killed 125 people. Humanitarian workers are struggling to calm community fears in easternDemocratic Republic of Congo, where 125 people have died fromEbola, and cases of the virus are spreading quickly. The World Health Organization (WHO) said Friday that 200 cases of the deadly virus have been registered in the current outbreak first detected on August 1, with 165 of them laboratory confirmed and 35 considered probable. Among the latest individuals to test positive for Ebola is an employee of the United Nations, according to the head of UN peacekeeping mission, Leila Zerrougui. The haemorrhagic fever spreads through contact with the bodily fluids of its victims and typically kills about half of those it infects. The UN agency voiced concern over theswelling number of casesin recent weeks, especially in the town of Beni, near the Ugandan border. “Insecurity that has increased in the city is one of the reasons why we are seeing these new cases coming up,” WHO spokesman Tarik Jasarevic told reporters in Geneva. The latest outbreak – the 10th in DR Congo since Ebola was first detected there in 1976 – emerged in the restive northeastern region of North Kivu, which is home to a clutch of armed groups. WHO has warned that the latest outbreak could last for at least three to four months. The authorities in Beni have announced measures to protect health workers after a number of incidents where response teams were assaulted. 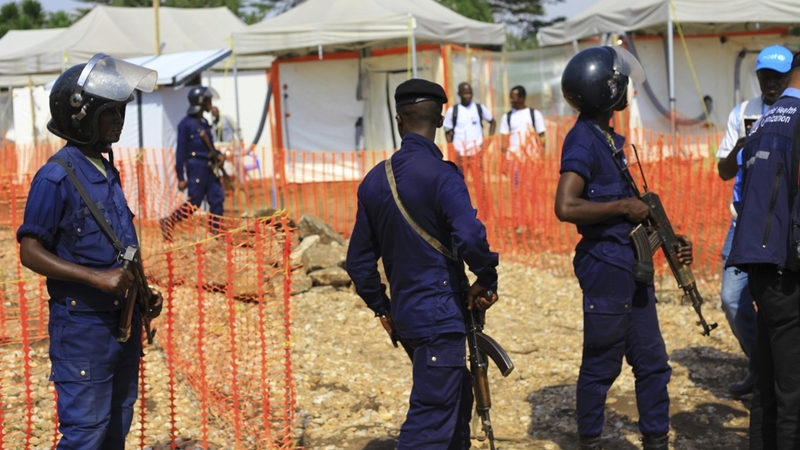 Two Red Cross volunteers were seriously injured when they were attacked during the burial of a suspected Ebola victim last week. The International Federation of Red Cross and Red Crescent Societies (IFRC) said on Friday that it was doing everything it could to minimise the risk to its volunteers on the ground. But IFRC Secretary-General Elhadj As Sy stressed that the organisation would never resort to using armed escorts in the areas. “We never use military or armed group protection to do our work … That is not part of our modus operandi,” he told the AFP news agency. He said it was not surprising that people living in an area affected by armed conflict would be “totally overwhelmed with another shock like the Ebola crisis,” and might have “wrong reactions”. “It is not unusual for us to experience these kind of difficulties,” he said, adding that much of his organisation’s work involved engaging with community members to build acceptance of the Ebola response work. While IFRC is taking additional safeguards to protect its volunteers, Sy stressed that there were no plans to withdraw from problematic areas. “It is exactly when it is most difficult, in the time that it is most risky, that we are needed most,” he said. WHO meanwhile temporarily suspended its work trying to halt the outbreak in Beni last month amid increased attacks by armed oppositions groups. Jasarevic said Friday that the agency had resumed its work there, but lamented that continued attacks and violence between government and rebels, while not directly targeted at Ebola responders, meant teams were “not able to function fully”. “On a daily basis, we can’t go for a couple of hours to some areas because there is either a shooting going on, or there is a protest by groups in the city against this violence,” he said.